As noted below, I recently got hold of this hard to get film. In a funny case of coincidence, I was chatting with a blog follower about a certain actor, Giovanni Vari. I helped him identify the actor and by looking at the actor's list of titles, I came across this title and added this title to the Ultimate Most Wanted list (which I'm updating at the moment) and then just this past weekend, someone else sent me a list of titles of films they just got, and this one was part of it! Funny how things work out in the end. 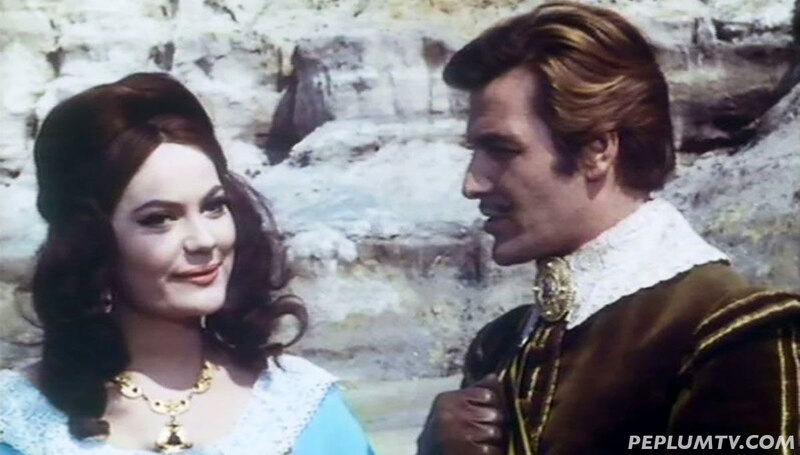 Exterior scenes were almost entirely shot at the most popular location with PEPLUM productions, Tor Caldara (seen in the screenshot above). I already wrote about this famous location here at the blog : link. This is also the kind of film its entire cast crew weren't really involved in the making of many other PEPLUM films, which makes it more difficult to come across. Glad your collection continues to expand. If the film's video and audio quality are reasonably decent, a Peplum TV release (either dubbed or subtitled) would be appreciated. However, the plot sounds a bit hokey for a pirate flick. Furthermore, IMDB's website shows it averaging only two stars (4/10) from thirty reviewers. What is your assessment of its quality? Thanks.